A few pictures from around our home today. You can't stop kids from collecting. This is Otis' UK beach treasure collection. So precious! Lots of rocks and sea glass. We can teach children how to value and take care of their collections, a little display box is a nice. We are supporting Otis' interest in Astronomy. I'm hoping for clear skies so we can see some of these stars. Using a telescope and locating the stars isn't easy but we are learning alongside Otis. Otto learning about object permanence. We finally put a little mirror up in his room and a hook for his robe. I don't love the look of these temporary hooks but they do the job. This mobile makes me happy, it's so peaceful and graceful. 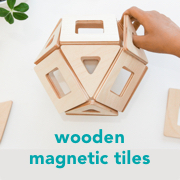 Completely natural, wooden blocks. We build towers and he knocks them down. Here are a few articles that I've been reading and enjoying this week. 〉Fostering Scientific Thinking in Children at Mother Mag. 〉L'Atelier aujourd'hui or The Workshop Today at Où es-tu, Coquelipop. This is a lovely Montessori learning space for two children, six and seven years old. 〉"While I see many parents set up incredible looking invitations to play for their children which allows them time to get on with house work or have time for themselves, it doesn’t feel right for me. The packs of stickers and pom poms, glitter and storage boxes of preschool entertainment, simply feel like extras to think about. More money spent and more “stuff” to store that our little house can’t home, and a growing environmental conscience questions. Is there really a need for these disposable play items?" Something to think about. 5 Ideas to Grow Your Child's Independence at Mamalina. 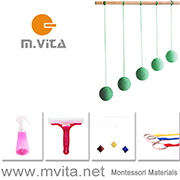 〉This learning and play space for a two-year-old at MontiMinis. Lena writes how she has reorganized the space and rotated materials to renew her children's interest. 〉If you are a Montessori teacher you may be interested to hear The Work of Wool: A Montessori Handwork Album is now available at Montessori Handwork. I hope all schools order a copy! 〉A view on Montessori and social media at the Montessori Family and Can we take Montessori too far? at The Montessori Notebook. I'd love to hear your thoughts. 〉Lots of good tips here - 5 First Steps in Teaching Photography to Your Kid at Rainy Day Sunny Play.